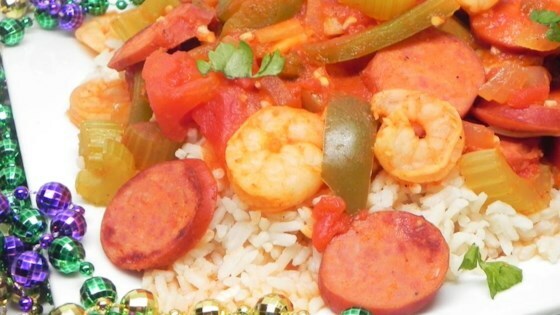 "A Cajun jambalaya that suits the whole family!" Very good and easy to make. Was really pleased with the way it turned out. I did use a little red pepper and some smack your mama seasoning to kick up the heat just a little. Ok. Sooooo. I made this and i can say yes thats a family favorite. I have subbed some items here and there as needed. I used tomato soup vs saice and just added some oregano and basil. Very good. No shrimp on hand and did miss that flavor. It will stay as a favorite. I loved this and the leftovers were even better. I used Old Bay because that is what I had on hand.It reminded me of a crawfish dish I have in a restaurant. Will make again! !